I woke up tired and dragging. I think it was the first day I really had trouble getting going. I decided I would take the shorter route and skip La Romieu, but I really wasn’t sure about the decision. I didn’t want to regret not going. But up until this point, whenever I had a choice, I’ve always chosen the harder route instead of the easier. But the past two days I had 30k and 33k, and tomorrow I have a 34k day, so I really thought that taking the shorter day was best in the long run. I was the last one to leave this morning, shortly after Claire. Claire is a younger girl, probably around my age, I really don’t know. She’s most tent camping in a bivvy. She was at the gîte in Moissac, but didn’t participate in the dinner. I didn’t really meet her until yesterday when she showed up at my gîte in St. Antoine as well. Then she showed up at the gîte in Marsolan! It sounded like she was going to the same place in Condom as well (Yes, that’s an unfortunate name, isn’t it?). We were both moving slowly and had both decided to take the shorter route. She left a few minutes before me and said I would catch up. She was in a lot of pain from a blister. I tried to stop at the church on the way out of town, but it was locked. I guess I should have gone the day before. I headed off down the hill, but I didn’t see Claire. As I was walking under a tree, I felt something cool slip down the back of my shirt. That would have been a really great time to have someone else there. I decided to pick up the pace and see if I could find Claire. After about 1k of not seeing her, I couldn’t stand it any longer and took off my pack to try to shake out of my shirt whatever it was. Turns out it was an acorn. Thankfully harmless! In the hosts’ yard. I wonder if they harvest them! Any way you look at it… It’s mucous. I never did see Claire. Either I somehow ended up in front of her, or her painful blister really didn’t slow her down at all, or she changed her mind and went to La Romieu. Not every place I Pass is pretty. Apparently this is where cars and hay bales go to die. I got to the point in the path where I had to make the decision to go to La Romieu or take the path without it. Even though I left the gîte at 9:45, I got to the point exactly 1 hour later, and it was supposed to be 5k. 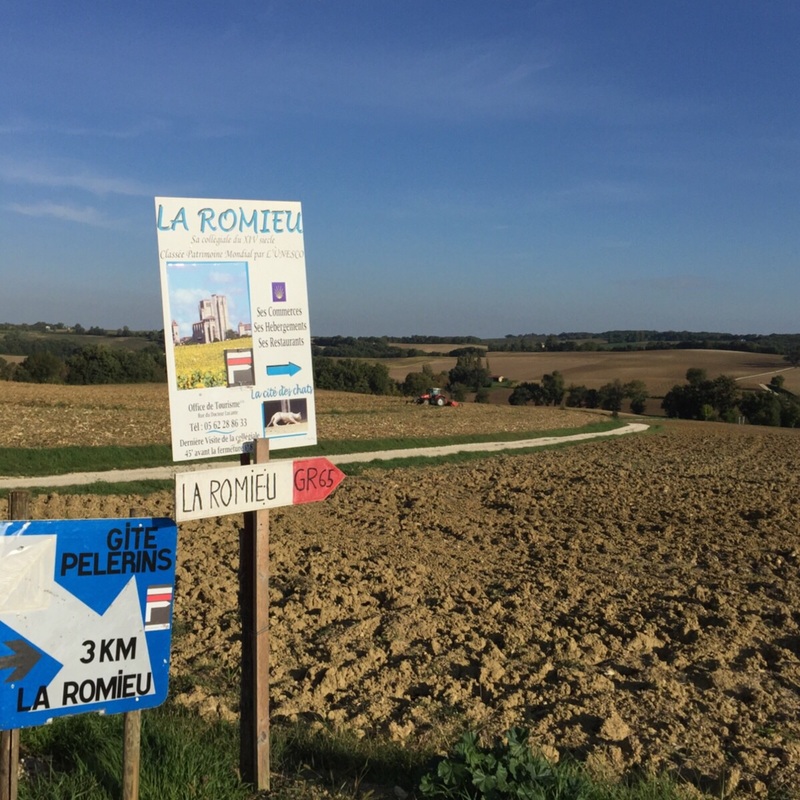 There was a sign at the point that said going through La Romieu was 8.3k, and not going there was 4.6k. According to my book, though, going there was 10k. I stood there, agonizing, about which way to go. The problem with these distances is that they’re often not accurate. Which was right? The book or the sign. Neither? The last thing I wanted was to go and have it turn out to be more than 26k. After spending about 7 minutes weighing my options, I decided not to go and hoped I wouldn’t regret the decision. I did catch up with 3 ladies, and it turns out they were there my first night in Moissac! Marie, Beatrice, and Dani. It was fun to see them again. Today was more walking through farmland. There was a nice wind, and even though the day started out sunny, it grew cloudy and grey. This morning as I set out, looking at the sunny sky, I was wondering when it would rain again. I didn’t actually think it would rain today, but it did. It didn’t rain very hard. I put my rain cover on my pack, but I didn’t bother with covering myself. I used the rain as a way to make myself feel better about not going the longer route. It’s the poppy painting! Without the poppies! I could see Condom at 11:45. It only took me just over 3 hours to get there. Turns out it wasn’t 19k after all, it was only 16k. I totally could have gone to La Romieu and gotten to Condom at a decent time. I decided to make up for it by getting lost trying to find my gîte. I walked by an Asian restaurant and figured I’d try something new. I was lured by the menu option, which I shouldn’t have. It wasn’t bad, it just wasn’t good. Well, it wasn’t bad. Then I decided I would walk parallel to the general direction of my gîte then cut over on a side road. Side roads don’t cut over, so I ended up doing a lot of unnecessary walking. Yay. I finally got to the gîte right about 2 pm, which turned out to be right on time. It didn’t say in the book, but it didn’t open until 2. I have a room to myself, so hopefully I can sleep well and get a good start on tomorrow. I have not been sleeping well. I wake up many, many times during the night. Last night part of the problem was my bed wasn’t level. I took a shower, then spent most of the afternoon trying to figure out how to mail a package to a postoffice for me and how long it would take. Then I ordered some new socks and shoes on Amazon. Hopefully this works. Keep your fingers crossed for me! I think I would probably survive with the same shoes, but new shoes would be so very nice. My current shoes do not look like they’re only 3 weeks old. Maybe Spain will be kinder to the new shoes. I will be mailing the stuff Poste Restante to St. Jean Pied-de-Port and I can just pick it up at the post office. Hopefully it will get there in time. Have I mentioned my blister? I don’t think I have. I got a blister back in the Célé Valley. It was on that second day where I was going really fast. The blister is on the side of my left big toe. I think going down all those hills with all the rocks caused my toe to rub on my shoe. It wasn’t a big blister, and I didn’t walk on it, so it didn’t bother me. I decided to leave it alone and let it pop on its own, but it never did. It even got a bit bigger. I decided to let someone pop it today. I figured the skin underneath was probably healed pretty well, so it wouldn’t hurt, literally or figuratively, to pop it. Hopefully I do not get any other blisters! I guess the shorter day was worth it because I had to do all the logistics of figuring out how to mail stuff to myself. I think I will be happier in the long run, because it is a long run (walk). Right now I’m just a bit tired and irritated. I’m sure I will feel better after dinner. I’m sure I will also feel better after this week. Next week I will be kinder to myself on the distances. I still have plenty of time, right? Right. I am having some kind of tendon thing happening, though. I think it’s only temporary. When I try to point my toe up the tendon down the front of my ankle really hurts. I’m not going to worry about it unless it still hurts tomorrow. Dinner was acceptable! The starter was soup, then fish and potatoes, and then a quite good cake with a pear in it. Claire is mostly tent camping in a bivvy? What’s a bivvy? I’m surprised to see the prickly pear cactus. Is it pretty dry there? “Where cars and hay bales go to die” made me laugh! Yay for having a room to yourself! Hopefully the shoes and socks will arrive in good time. I hope you and your new shoes are able to meet up! I am sorry about your leg pain. Have you ever had shin splints? It sounds similar. If you still have pain, I would try to take it easy for a couple if days, not walking such long distances. Try stretching the front of your shins by pointing your toes down and ice the area a few times a day. You could also take ibuprofen. 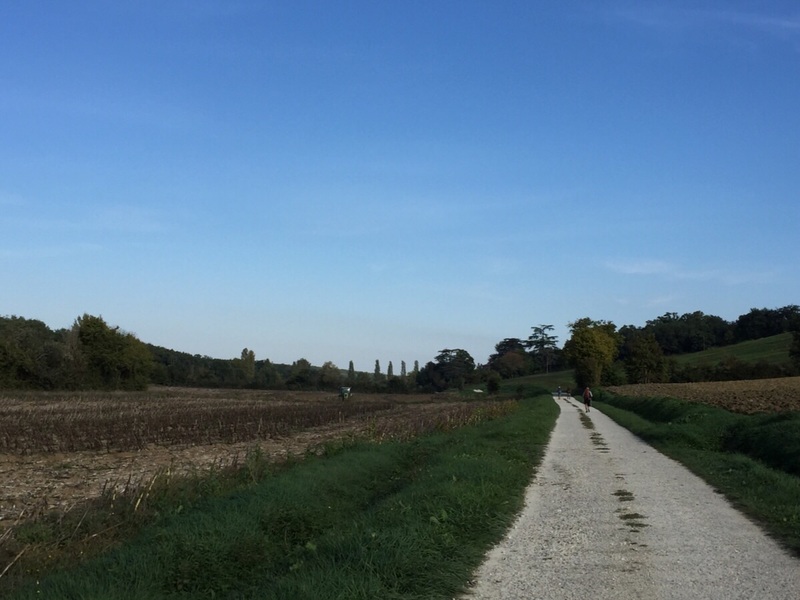 It looks like you are about 3/4 of the way across your French portion of the Chemin. Stretch those tendons regularly, for sure! Can you get moleskin patches (not really made of moles, of course) to cover the blister (and other proto-blister) areas?